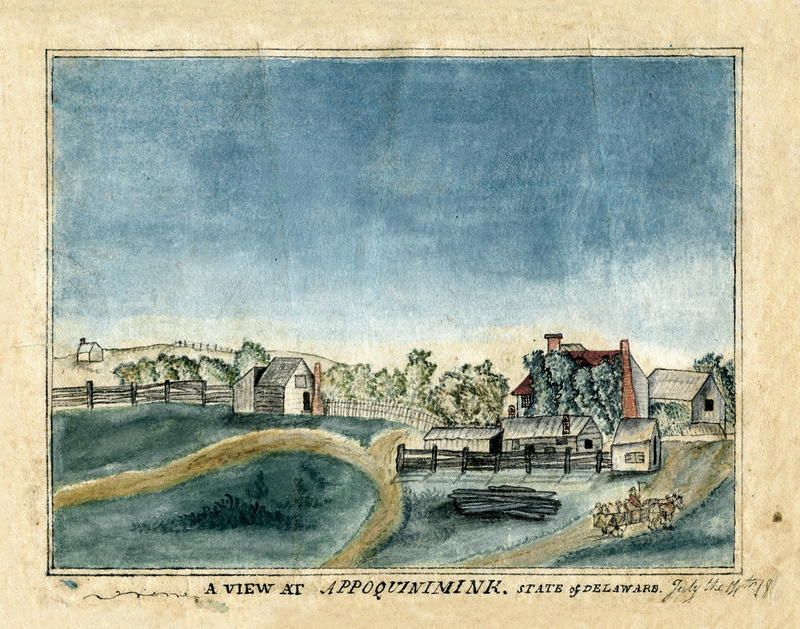 G. W. Janvier, A View at Appoquinimink, State of Delaware, watercolor on paper, 1805–20. Odessa, Delaware, located where the Appoquinimink empties into the Delaware River, is a cul-de-sac of history. This small river community flourished from the mid-18th through early 19th centuries as a marketing hub for the shipping of grain and goods across the Delmarva Peninsula between the Appoquinimink (with access to Wilmington, Philadelphia, and the Atlantic) and the Chesapeake Bay (en route to Baltimore and Annapolis). Local businesses included William Corbit’s thriving tannery, David Wilson’s dry goods store, and John Janvier’s and Duncan Beard’s cabinet- and clockmaking shops. But prosperity was not to last. In 1829 the Chesapeake & Delaware Canal opened for business and began diverting river traffic, undercutting Odessa’s economic foundation. Further competition occurred in 1832, when the railroad connected wharves in New Castle with those in Frenchtown at the head of the Chesapeake and then extended south to Middletown, only three miles west of Odessa, in 1855. That year, town fathers retired the original name, Cantwell’s Bridge, in favor of Odessa, the Black Sea grain-shipping port in Ukraine, but the community’s heyday had passed. Although circumstances continued to decline, several fortunate events as well as the actions of history-minded family members and citizens have ultimately resulted in the preservation of the best of Odessa and its material culture. William Corbit (1746–1818), the tanner and a successful real estate investor, completed a magnificent Georgian house in 1774. He also built a dynasty—fathering thirteen children from four marriages. Of those children, Daniel, as last male heir, assumed responsibility for orphaned family members and businesses as all his married brothers died before 1833. He actively embraced the family history, gathering documents and furnishings and preserving the family homestead. 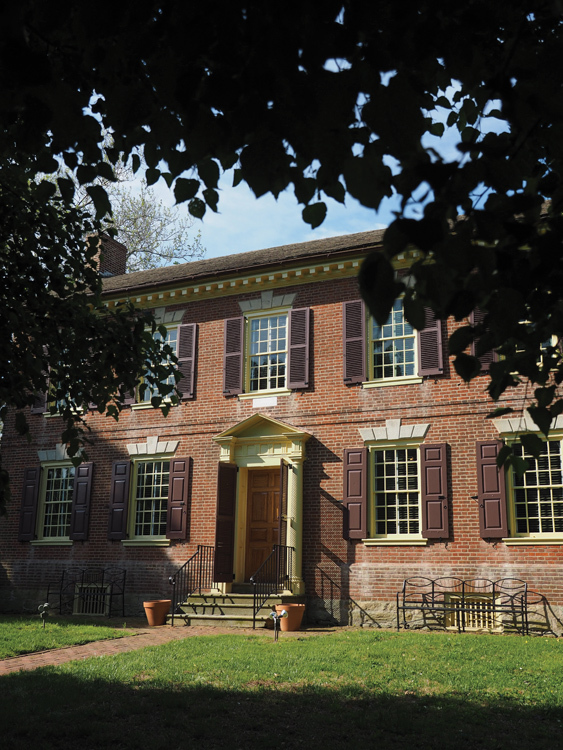 In 1847, three years after his wife’s death, Daniel married Mary Wilson, who had grown up next door in the imposing house built about 1769 by her father, David (1743–1820). This alliance of two of the town’s most prosperous families spread stewardship interests broadly in the ensuing years. In 1901 Daniel and Mary’s daughter, Mary (later Mrs. E. Tatnall Warner), purchased and restored the Wilson family house, which functioned as a museum—another example of historic preservation in this small town. And Daniel’s own efforts to preserve the architecture, furnishings, and history of the Corbits ultimately found the perfect patron in H. Rodney Sharp (1882–1968), who acquired the intact family house in 1938, restored it to its original appearance, and gave it to Winterthur as a house museum in 1958. Sharp, a Delaware native, restored other historic buildings in Odessa as well, fundamentally preserving the late 18th-century character of the town. When William Corbit and other leading residents of the region were in need of the very best in furniture, they turned to cabinetmaker John Janvier (1749–1801), also of Cantwell’s Bridge. Among Janvier’s work is a tall clock case that houses a movement by Odessa clockmaker Duncan Beard (working 1765–97). Like Janvier, Beard was a highly competent artisan who attracted broad patronage. The clock bears the engraved initials “JA” with Masonic symbols on the dial and may have been made for a fellow member of the Appoquinimink Masonic Lodge. The case embodies all of the imaginative earmarks of Janvier’s work. 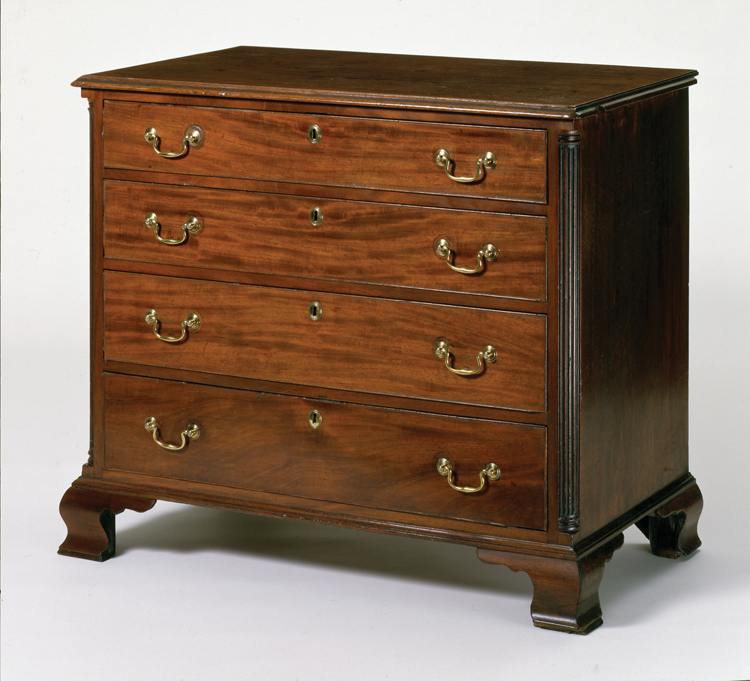 Another Janvier product, a regionally distinctive four drawer chest signed in chalk on the bottom “John Janvier at Cantwell’s Bridge,” displays particular accomplishment in its materials and construction, including a detail heretofore only associated with eastern Massachusetts chests: the top slides onto half-dovetail-shape tongues cut along the tops of the side boards rather than being attached with glue blocks and/or screws. Furniture historians might opine that Janvier had seen and copied Massachusetts examples, perhaps loaded as venture cargo on vessels that stopped in Odessa, but Janvier was exceptionally talented and creative. Sufficient innovation exists in his case furniture to support his authorship of this feature. Other family-owned objects at Odessa include samplers worked by Daniel Corbit’s two nieces in 1823 and a mourning brooch containing locks of hair from their mother and/or father that is featured in mid-19th-century oil portraits of each woman. Also surviving are David Wilson’s Bible box, letter box, and snuff box shaped and painted to represent a Dalmatian, along with a large needlework mourning picture made by Ann Jefferis, who married David’s son and namesake. 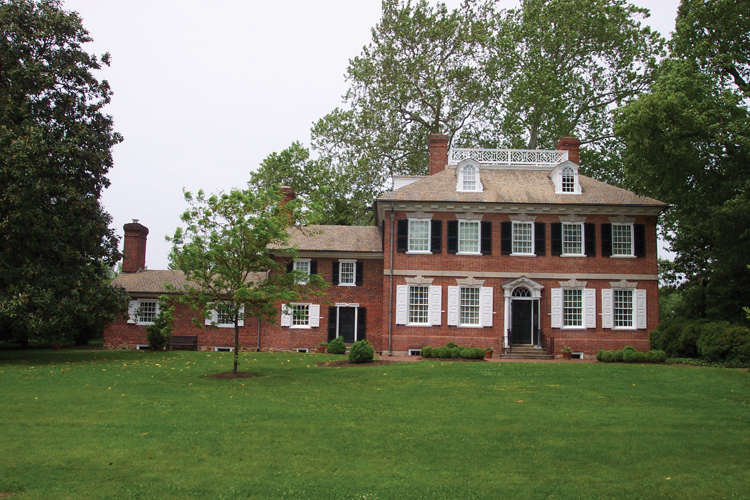 The Historic Odessa Foundation, formed in 2005, now owns and administers all of the Odessa properties: the Corbit-Sharp and Wilson-Warner houses; Corbit’s 1780 Pump House, built for tannery employees; Cantwell’s Tavern (ca. 1822); the Odessa Bank (ca. 1855); and the gambrel-roof Collins-Sharp House (ca. 1700), which Rodney Sharp had moved to its present site behind the tavern to preserve it. In addition to Sharp’s preservation leadership, Sharp, Corbit, and Wilson family members and descendants of other local families have donated items of all kinds. Accordingly, room installations in the Corbit and Wilson houses represent area made and owned furnishings in addition to those that never left the premises. These objects, passed down through generations, convey an intimate and accurate sense of life in the late 18th and early 19th centuries, giving visitors to Odessa an extraordinary historical experience. Post by Philip D. Zimmerman, Ph.D., a museum and decorative arts consultant based in Lancaster, Pa.
For more information, please visit historicodessa.org. This entry was posted in Architecture, Decorative Arts and tagged Ann Jefferis, Appoquinimink, Appoquinimink Masonic Lodge, Cantwells Bridge, Chesapeake Bay, Chesapeake Delaware Canal, Collins Sharp House, Corbit Sharp House, Daniel Corbit, David Wilson, Delaware River, Delmarva, Delmarva Penisula, Duncan Beard, H Rodney Sharp, Historic Odessa, Historic Odessa A Past Preserved, Historic Odessa Foundation, John Janvier, John Janvier Sr, Mary Wilson, Mary Wilson Corbit, Mrs E Tatnall Warner, New Castle, Odessa, Odessa A Past Preserved, Odessa Delaware, Philip D Zimmerman, Philip Zimmerman, Rodney Sharp, William Corbit, Wilson Warner House, Winterthur, Winterthur Garden, Winterthur Library, Winterthur Museum, Winterthur Museum Garden & Library. Bookmark the permalink. There are many of my relatives buried at the old St Peter’s cemetary, one of whom was the beginning of the James B. Doughten legacy. My great, great, great grandfather had a son named James Benedict Doughten who is buried next to his father there on the right side of the old church (the stone has been broken and repaired) and was only 17 years old at the time of his death. In fact, my dad told me that the Doughten’s had a store in Odessa in the 1800’s, but that I don’t know for a fact. I do have some old relics that I would donate to the Historic Odessa Foundation if interested. The items have been in my family for many years and I am afraid no one is really interested in old artifacts of prior years in Delaware. I have an old Civil War Infantryman’s sword and a cane chair that was hand-made in the early 1800’s in perfect condition. If interested, I will deliver them to the Foundation free of charge. If there is no use for them, I will donate them to the Milford Museum in Milford, DE where I now reside.